The head of the UN’s nuclear agency has said Iran is only at the early stages of enriching uranium.Mohamed ElBaradei said Iran had not reached the industrial scale of uranium enrichment it claimed recently. Mr ElBaradei said Iran had only hundreds of centrifuges for enriching uranium, not the thousands that would be needed for industrial production. Tehran says its nuclear programme is peaceful, but the West fears it wants to build atomic bombs. The head of the International Atomic Energy Agency (IAEA) said international concern over Iran’s nuclear programme was based on its motives, rather than its current capability. “Iran is still just at the beginning stages in setting up its Natanz enrichment facility. 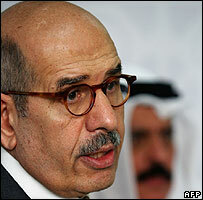 The talk of building a facility with 50,000 centrifuges is just at the beginning, and it is currently only in the hundreds,” Mr ElBaradei said. The UN Security Council has imposed a package of sanctions on Iran over its refusal to cease enriching uranium, which some Western countries fear could be part of a secret nuclear weapons programme. On Monday the Iranian president said his country had “joined the nuclear club of nations” by beginning the industrial scale enrichment of uranium. Russian officials have already expressed doubts over the Iranian claims. This is the first time Mr ElBaradei has commented on Iran’s announcement that it has entered a new phase in its enrichment programme. He said that Iran would not be able to produce the highly enriched uranium needed for a nuclear bomb as long as it remained under the supervision of IAEA inspectors. A team of IAEA inspectors is currently in Iran where it has been making a routine visit to the enrichment facility at Natanz.